*The following is a guest post from Karma Yogi Alysha Graham (Ashland, OR) following her visit in October, 2017. Thank you Alysha! Alysha transplanting some of our native plant donation. I fell in love with Sweetwater before I arrived. The intense raw beauty that is Big Sur was incredibly alluring. Even the one-way winding and curving road leading back to Sweetwater Sanctuary through the ancient redwoods, with moss covered hobbit homes was astonishing. Once I arrived on the land, the first thing that struck me were its immense trees. Burned? It felt so alive! The entrance has a beautiful winding creek with lush plants growing along its bank and a massive cluster of three redwoods rising straight and tall right out of one trunk. 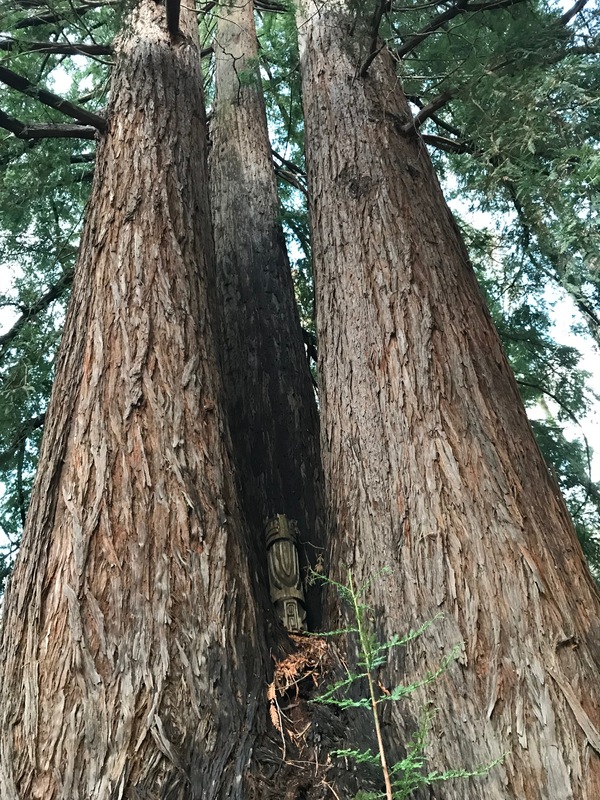 By the end of my visit I started calling this group of redwoods the triple gem tree, they seemed to be guarding the entrance to the sanctuary. The new smells I hadn’t known before filled the air…it was the Bay trees, with their thick dense massive trunks and Eucalyptus that don’t grow up in Oregon where I’m from. We toured the land, as I listened to the stories of what had burned, I could feel the readiness of the land to create a new story. So much of the debris was cleared away that I couldn’t even tell where structures once had been. ‘A blank slate…what wants to grow anew?’ This question filled every corner of my mind as we walked and listened. The hummingbirds hummed, clustered around the tropical plants surrounding the old swimming pool. As we climbed the hills, meeting the simplicity of what now stands…three small cottages and a yurt, a profound sense that the land is in a deep pregnant pause filled me and the expanse that stretches out across the mountain tops. During my visit, Kay, John and I had many talks about the relationship between goal oriented human pursuit vs. the process of patiently listening to the land. The art of listening could be seen as a dying art in our current culture. The way of bulldozing over the natural world, instead of building along with its natural curves, lush contours and enhancing what wants to flourish by first watching and listening to what is inherent in its beauty. Where are the land dreamers? Those that can hear the dream of the land? whom have developed this lost art of listening? Being intimately with the stillness and also know the language of permaculture, how to build in accordance with the dream…the bio-rhythms and cycles of life. When and how will we humans find a way back to the art of allowing, spaciousness pervading the deeper root of our innate all-knowing inner sense, expanding past the frantic rush of the logical brain chatter. Isn’t that what a hermitage wants to be built upon? My favorite part of being at Sweetwater Sanctuary happened on the last morning of my stay in the little cabin beside the creek. I threw back the cozy covers, the brisk morning air nipping my skin. As I grabbed at my clothes, I spied a pair of eyes peering back at me. A small adolescent deer was looking in through the window. It was utterly entranced wide eyed as could be. I laughed, and started talking to it, exclaiming how odd ‘he’ must think we humans are, putting on strange layers of polyester colors. The windows are warped from the burn and don’t entirely shut so I knew ‘he’ could hear me. His ears and tail twitched, his eyes locked on my naked form. Within a minute or so, what I labeled as his sister joined him. ‘She’ wanted to see what he was so transfixed by. So I chatted and they stared back. As I picked up an article of cloth that was white, that was it! white! was too much for them, and they were off in opposite directions like a flash of lightning. Thank you Sweetwater for sharing your sweetness!